Not by borsch alone: You won’t believe what else can be made with beetroot! Moscow’s renowned chefs share recipes that will blow your mind. Everyone has heard of borsch, and most know its main ingredient is beetroot. But Russian cuisine is famous not only for borsch, and you can make many other meals with beetroot. Today, it seems Moscow's top restaurants are competing to serve you the most bizarre and amazing dishes made with beetroot. The beetroot is a special vegetable for Russians because it’s the main ingredient in the world-famous borsch. You might be surprised, but the beetroot did not originate in Russia. The burgundy beauty was brought to Ancient Rus' from Byzantium, and it was immediately regarded with high esteem. And why shouldn't it? The beetroot contains folic acid, which is good for the nervous system; has a large quantity of iodine in respect to other vegetables (for example, 7-17 micrograms versus 0.2-6 micrograms in carrots); contains betaine, which regulates fat metabolism; and has magnesium, as well as a whole bunch of other vitamins and minerals. This ode to the beetroot can continue, but it’s time to eat! RBTH is happy to share some exotic beetroot recipes from Moscow's most prestigious restaurants. 1st layer - mash the potatoes with garlic and mayonnaise. 2nd layer - mix herring with mayonnaise. 3rd layer - cut the apple, potatoes, beetroot, carrots and herring into cubes. Add mayonnaise and chili sauce. Mix everything into a homogenous mass. 1. Cut the boiled beetroot into thin circles. 2. Place the homogenous mass onto a plate. Decorate with the thin beetroot circles. 3. When serving embellish the dish with green onions. 1. Mix the sour cream, finely diced garlic, coriander and cucumbers to make the Matsoni sauce. 2. For cold borsch, stew the grated beetroot and blackberries for about 90 minutes and then pour in the kvas. 3. Place a tablespoon of Matsoni and leek rings in a plate, then pour in the cold borsch. 1. Boil the beetroot and cut into thin slices. 2. Prepare ravioli filling - crush the avocado with a fork and finely cut grapes. 3. Crack the walnuts into large pieces. Mix the ingredients, and add a small amount of olive oil, salt and balsamic drizzle. 4. Place the filling onto beetroot slices and cover with remaining slices. 1. Clean the beetroot and marinate for 45 minutes in pomegranate juice, olive oil, balsamic vinegar and ginger. Bake in an oven at 180 degrees Celsius for an hour. 2. Slice the pear and boil with thyme and sugar for 15 minutes. Cool in the same water. Brush on the BBQ sauce, and grill. 3. Boil the quinoa. Cool and mix with the mint, basil, narsharab sauce and olive oil. Compose the dish and decorate it with the sheep cheese. "I called the drink antioxidant or "for weariness" because every ingredient is healthy and all together they give you strength, and act as a strong antioxidant. The green apple helps liver detoxification, removing harmful toxins. The carrot is a natural antioxidant and the brighter its orange color, the healthier it is. To balance the taste I add orange pulp. This citrus is great to fight weariness. 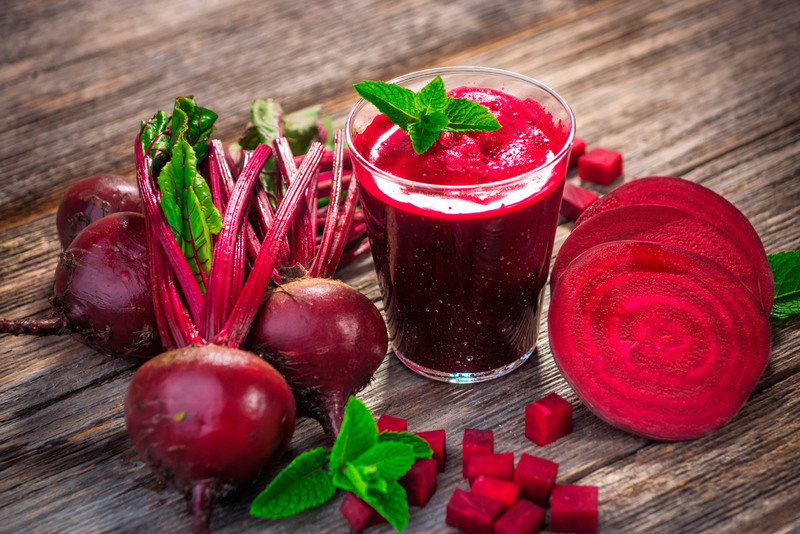 The most important ingredient, which unites all these healthy qualities, is the beetroot." Squeeze fresh juice from all the ingredients and mix. Jamon passion: Do Russian restaurants suffer without banned delicacies?